pies—and on the standard therapy available for H.
days where there is a high clarithromycin resistance. cate H. pylori in all treated patients. therapy needs to be confirmed in further studies. was 90% compared to 78% with triple therapy . 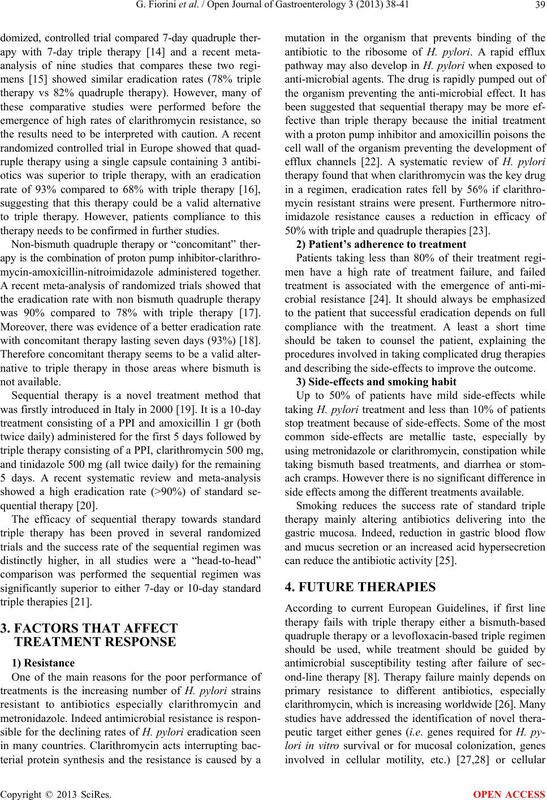 with concomitant therapy lasting seven days (93%) . 50% with triple and quadruple therapies . and describing the side-effects to improve the outcome. side effects among the different treatments available. can reduce the antibiotic activity . values as needed in the presence of gastric acid. for Helicobacter pylori. Gastroenterology, 133, 985-1001.
ulcer disease: Systematic review and economic analysis. American Journal of Gastroenterology, 99, 1833-1855.
nal of the National Cancer Institute, 97, 1345-1353. 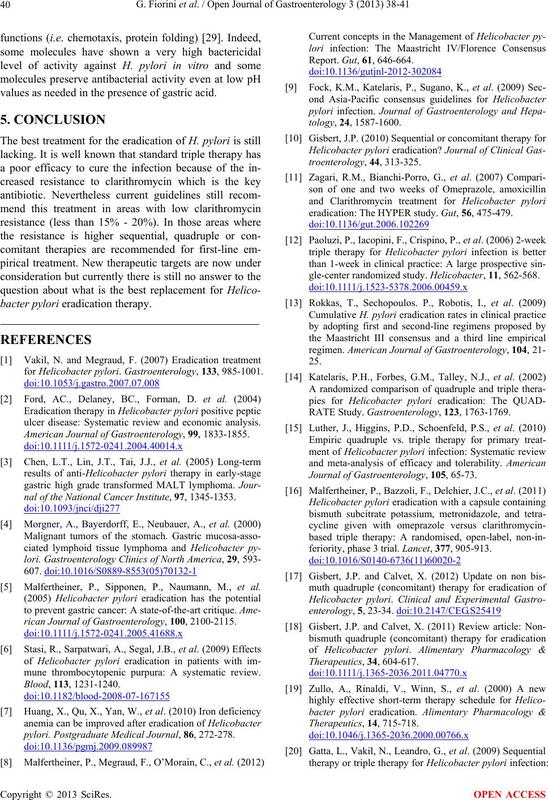 Malfertheiner, P., Sipponen, P., Naumann, M., et al. 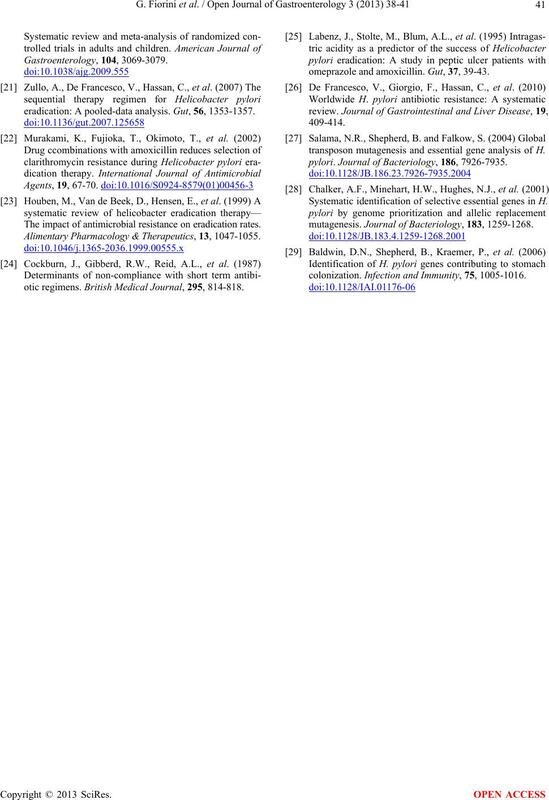 rican Journal of Gastroenterology, 100, 2100-2115.
mune thrombocytopenic purpura: A systematic review. pylori. Postgraduate Medical Journal, 86, 272-278.
eradication: The HYPER study. Gut, 56, 475-479.
gle-center randomized study. Helicobacter, 11, 562-568. RATE Study. Gastroenterology, 123, 1763-1769. 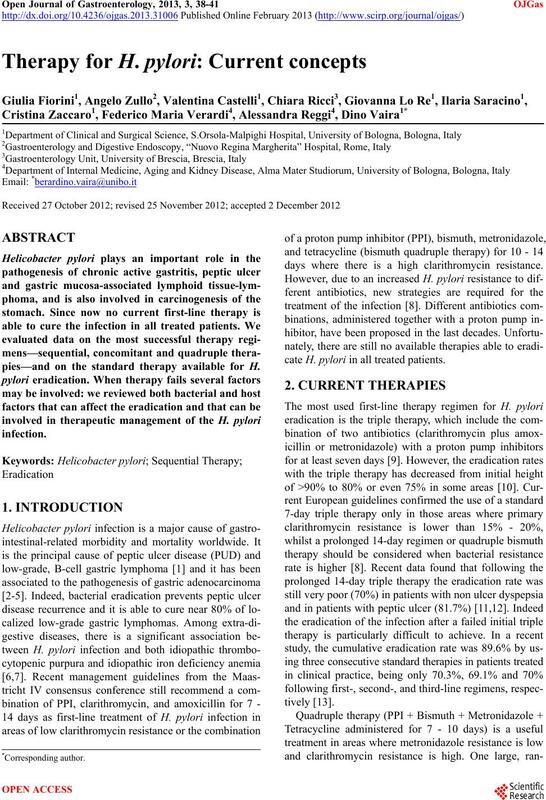 Journal of Gastroenterology, 105, 65-73.
feriority, phase 3 trial. Lancet, 377, 905-913.
eradication: A pooled-data analysis. Gut, 56, 1353-1357. The impact of antimicrobial resistance on eradication rates. Alimentary Pharmacology & Therapeutics, 13, 1047-1055.
otic regimens. British Medical Journal, 295, 814-818.
omeprazole and amoxicillin. Gut, 37, 39-43.
transposon mutagenesis and essential gene analysis of H.
pylori. Journal of Bacteriology, 186, 7926-7935. Systematic identification of selective essential genes in H.
mutagenesis. Journal of Bacteriology, 183, 1259-1268.
colonization. Infection and Immunity, 75, 1005-1016.